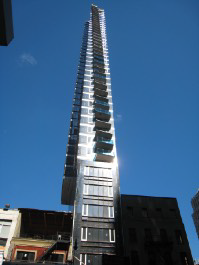 New Sliver Building On 8th Avenue | Custom & Private New York Tours, Inc.
A 44-floor rental that is 18 feet wide illustrates the concept of “air rights”; that’s a New York City invention. The drama of this edifice provides evidence of the “air rights” concept and draws wonder. View the best example of how New Yorkers find solutions to problems, achieving success. Camera a must! Would you live here? Sure, but don’t get dizzy or loose your balance! It may be the tallest disproportionate building on earth. Gotta see this!